The name “equinox” is derived from the Latin aequus (equal) and nox (night), because around the equinox, the night and day have approximately equal length. The ‘Managed Open Access’ at Stonehenge for the Vernal (Spring) Equinox, will be from approximately 05.45 am until 08.30 on 20th March 2014. Parking will be limited and cars will have to be moved by 9:00 am. 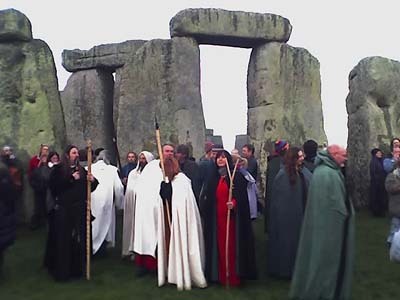 • Access to Stonehenge for the Spring Equinox will take place on the morning of 20 March 2014. • Entrance to the monument will commence as soon as ‘light-levels’ are deemed safe enough to permit. For the past couple of years this has occurred around 0545h however EH would ask that people are patient should the morning prove ‘overcast’ and a slight delay occurs. • Access to Stonehenge will cease at 0830h and the cooperation of all of visitors in ensuring the monument is vacated at this time would be most appreciated. Please note that, in previous years, access for the Equinox ceased earlier at 0800h, however English Heritage has permitted an additional half an hour within the monument for our visitors. • Temporary toilets (Porta-Loos) will be available at the monument once the site is open for public access. This includes a provision for those with disabilities. •The Cafe and Shop at the new Visitor Centre at Airmans Cross should be opening for visitors from approximately 0800h on the morning of 20 March. Please note that the toilets at this location will also become available for use at this time. Although the Cafe will be opening only hot and cold drinks will be available for the first hour. Pasties etc will become available after 0900h. Have fun and respect the Stones!